An informative webpage is Helping Marine Animals Stranded on the Beach -- with thanks to librarian Emma Garrison and intern Chelsea at the Charlotte Library, Charlotte, Tennessee, for this link. myFossil. Initially based at the Florida Museum of Natural History and with funding from the National Science Foundation, FOSSIL is cultivating a networked community (known as a community of practice) in which amateur and professional paleontologists collaborate in learning, the practice of science, and outreach. International Palaeontological Association. This link includes access to the Directory of Paleontologists of the World. The Biological Society of Washington - an international society of biologists whose primary interests center on the taxonomy and systematics of eukaryotic organisms. Members publish their observations in the Society's quarterly journal, the Proceedings of the Biological Society of Washington. Larger studies, symposia proceedings, and special collections of studies are published from time to time in the Society's Bulletin of the Biological Society of Washington. The Marine Ecology Centre, Seaport Place, Sidney, British Columbia, Canada. Gary Raham, natural science writer, illustrator, graphic designer, and amateur paleontologist, specializes in making science fun for children and adults. Peabody Museum of Natural History, Yale University - located in New Haven, Connecticut. Click here to search the invertebrate paleontology data base. For example, use the HigherRanks field and search for Stelleroidea in their data base. Museum of Comparative Zoology, Harvard University - located in Cambridge, Massachusetts. Click here to search the invertebrate paleontology data base. For example, search for Asteroidea in their data base. It is worth mentioning that the Department of Invertebrate Paleontology has an off-line database that exceeds the on-line database. Carnegie Museum of Natural History - located in Pittsburgh, Pennsylvania. Click here to search the invertebrate paleontology type specimen data base. For example, select Eugasterella in the genus field, and select "list all" for remaining fields. 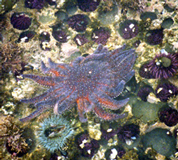 British Geological Survey For example, select Echinodermata as the Taxonomic Group, and enter Bdellacoma in the genus field. Muséum d'histoire naturelle de la Ville de Genève - Le département de Géologie et de Paléontologie du Muséum possède plus de 200'000 échantillons de roches sédimentaires et de fossiles d'invertébrés et de vertébrés, d'âges mésozoïque et cénozoïque surtout. Click here to search the data base. For example, search on Stelleroidea in their data base. University of California Museum of Paleontology - located in Berkeley, California. Click here to search the paleontology specimen data base. For example, select Asteroidea in the Class field, and click the search button. Florida Museum of Natural History - located at the University of Florida in Gainesville, Florida. Click here to search the invertebrate paleontology specimen data base. For example, select phylum Echinodermata, class Asteroidea, period Devonian, and click the "search catalog" button. Natural History Museum of Los Angeles County - in California. Click here to search the invertebrate paleontology specimen data base. For example, for Taxon Name select Level "class" and for Name type Ophiuroidea; for all of the Paleozoic select Upper Age as youngest Permian which is given as Tatarian, and select Lower Age as Proterozoic; do not check "this exact age range"; now click the "search" button. Trans'Tyfipal is a versatile and open database on the TYpes and FIgurated specimens of PALeontology housed in the different paleontological French collections. These specimens - macrofossils and microfossils - are the official and universal references that any paleontologist has to refer before any publication of a paper. This national database associates the laboratories of Paleontology of Dijon, Lille, Lyon, Rennes, the laboratory of Geology of the Museum National d'Histoire Naturelle de Paris (M.N.H.N) and the Association Géologique Auboise (Troyes). Click here for the portal to the data base. Gain access by clicking the OK button for "Non authorized people". For example, search for phylum Echinodermata, class Stylophora, and click the OK button. The Paleobiology Database - The Database is an NSF-funded project involving more than 70 professional scientific researchers and scores of graduate students. Its goal is to provide global, collection-based occurrence and taxonomic data for marine and terrestrial animals and plants of any geological age. Paleontological Research Institute, Ithaca, NY, Type and Figured Fossil Collection PRI's Type and Figured Collection consists of approximately 13,600 invertebrate fossil specimens, making it among the ten largest in the US. Portal to the first world list database of ophiuroid species names - a reliable and valuable tool for anybody, who needs to find information on ophiuroid species, compiled and maintained by Dr. Sabine Stöhr and Dr. Tim O'Hara. MarineSpecies.org is an effort in cataloguing all marine species. It is connected to OBIS and contributes to Species2000 and the Catalogue of Life. More information can be found on the website. Biographical Etymology of Marine Organism Names (BEMON) Link provided by Dr. Sabine Stöhr who writes: "This is a database of people who worked with marine organisms, both authors of species and honored in the naming of species, and their presumed friends. It was started and maintained by Hans G. Hansson, but after his premature death in 2011 it had been orphaned and was hard to find. I made inquiries and as of now, BEMON not only exists, but has its own URL. Those among you who asked me about its future can now rest assured that it is safe. If you didn't know about it, take a look and maybe it is of use to you. It is definitely very interesting and fun to browse. Maybe your own name is on it? Currently, there are no plans about updating BEMON, but perhaps it will happen in the future. Encouraging and appreciative emails now and then may help to keep this alive in the minds of those responsible. Best wishes, Sabine. Access the Caribbean Coral Reef Ecosystems (CCRE), Carrie Bow Cay, Belize, from: Invertebrate Zoology Section, Department of Systematic Biology, National Museum of Natural History, Smithsonian Institution -- click on "Research", then click on "Carrie Bow Marine Field Station (CCRE program)"
ReefBase -- a global information system on coral reefs, providing information services to coral reef professionals involved in management, research, monitoring, conservation and education. "Our goal is to facilitate sustainable management of coral reefs and related coastal/marine environments, in order to benefit poor people in developing countries whose livelihoods depend on these natural resources." CapeTides.com Cape and Islands tides and currents, sunrises and sunsets, moonrises and moonsets, twilight, moon phases, and surf forecasts. Martha's Vineyard Shellfish Group, Inc.
Link to BiodiversityWorks. Located on Martha's Vineyard, their mission is to promote conservation of biodiversity through wildlife research and monitoring while providing opportunities for people to engage in hands-on nature study.